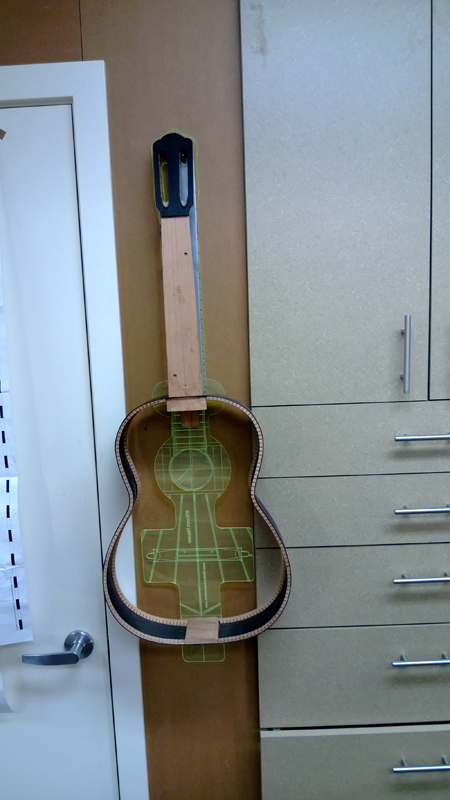 I have the neck and the rims finished including having the kerfed linings in and properly profiled. I did have one minor screw-up I will describe later in the post that I was thankfully able to fix with no damage. 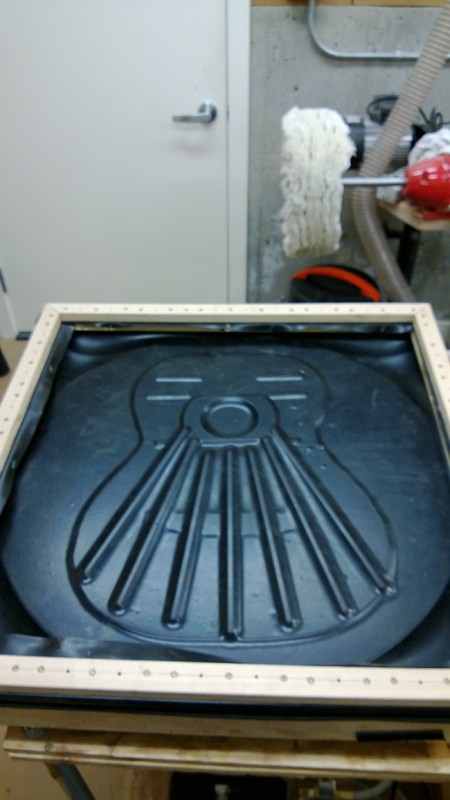 A classical guitar has a different neck\body geometry than a steel string. There are 2 reasons that I can tell for this difference. The first is that a classical guitar typically has the strings lower at the saddle position than a steel string guitar (10 mm vs. 14 mm.) Also, especial on the bass side, the classical guitar has a higher nominal action than a steel string guitar. 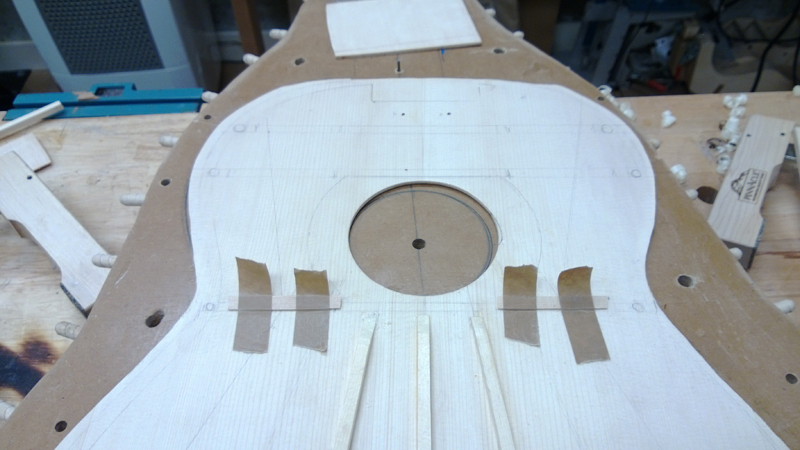 For some easy to see calculation lets pick a 6 mm thick fret board with a 3 mm desired action at the 12th fret. 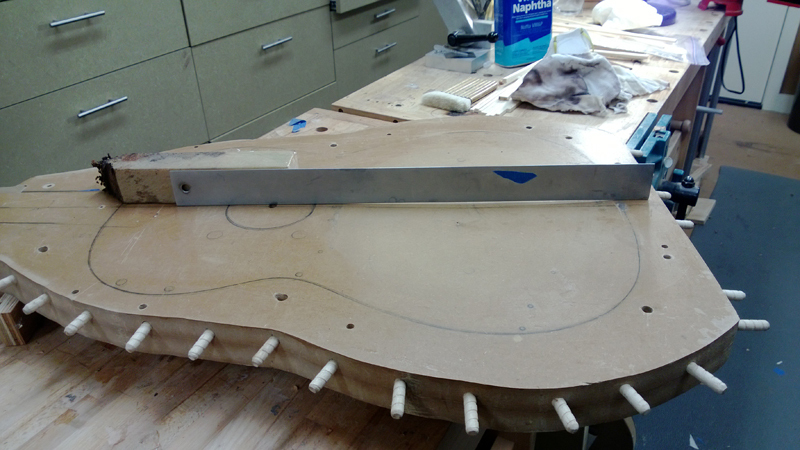 One needs 2 x the action at the saddle (6 mm) plus a 6 mm thick fret board plus a 1 mm fret it is easy to see that with no angle on the neck I am already too high, 13 mm instead of 10 mm. So if one was using a straight edge on the neck without the fret board the straight edge would have to go inside of the body at the saddle for the correct angle. On the SS it is about 1.5 mm above the top at the same location. 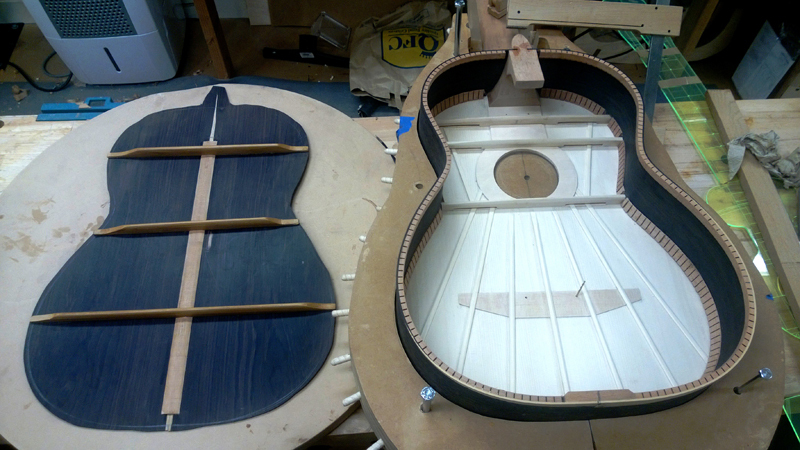 Classical guitar builders use a variety\combination of methods to create the correct geometry: tilting the neck toward the top so that the nut end of the neck is a couple of mm higher than the plane of the body, or planning the angle into the fret board; both methods are often combined with a dome only on the lower bout. 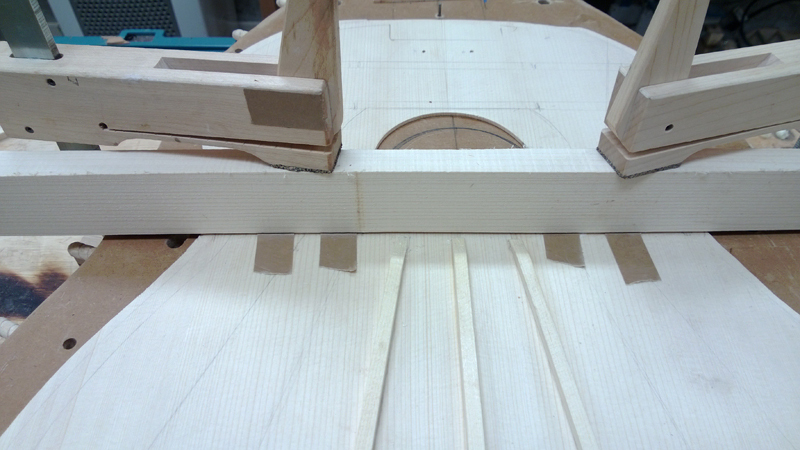 I keep the neck flat to the body and plane the desired angle into the fret board and make a dome. 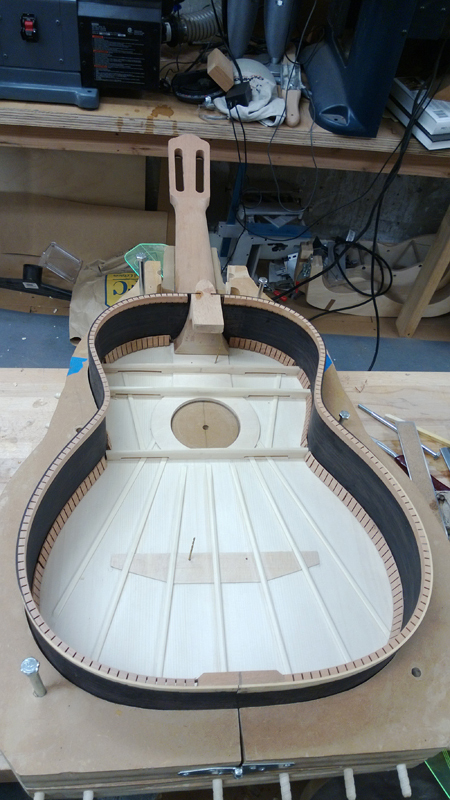 If you look at the picture of my solera you can see that I can use it to create the flat neck angle and the dome. Looking at the straight edge in the picture, you can see that the straight edge is in the dome with a flat neck angle. 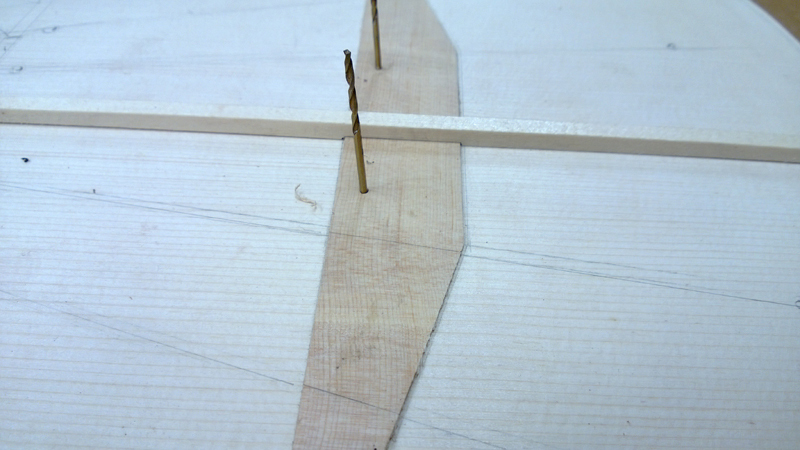 The neck angle in a classical with a Spanish heel is not fixed\set until the back is glued on. To close the box I will make sure the is top properly indexed in to my solera, I will first glue on the neck and rims on to the top. 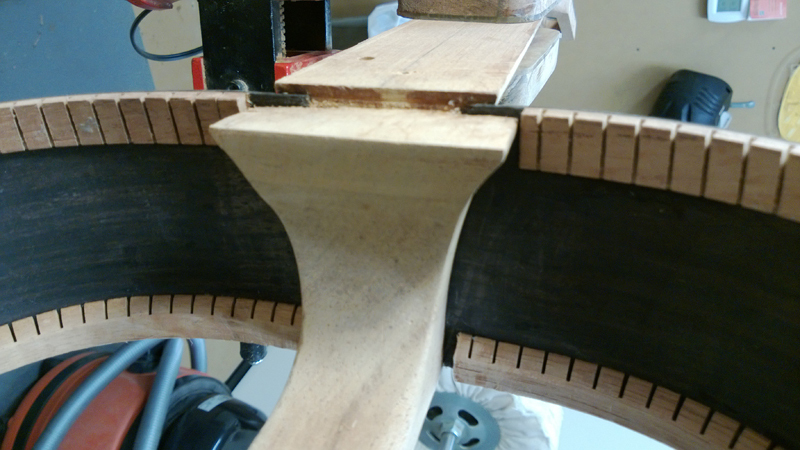 I also have index pins in the solera for the neck so I am sure that the top and neck are properly positioned as I clamp the rims to the top. I will have the neck clamped tight against the solera through this whole process. Leaving the body on the solera I will then clamp on the back. The solera keeps everything properly aligned while closing the box. 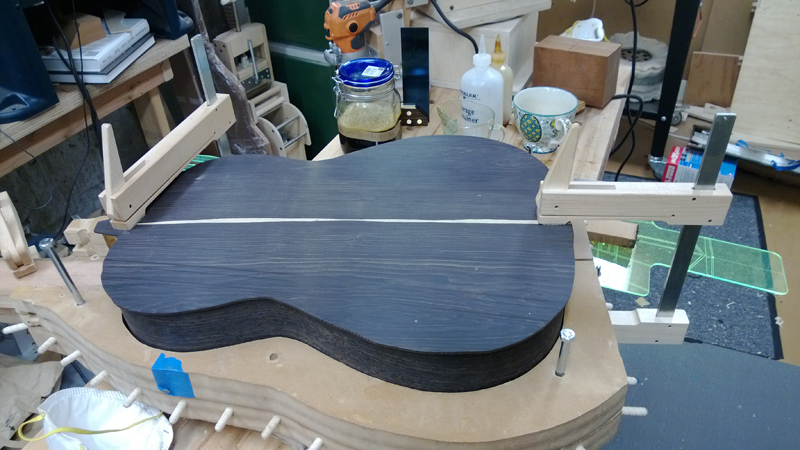 It takes a bit of care to profile the rims to work with the foot of the Spanish heel and an optional fret board patch. 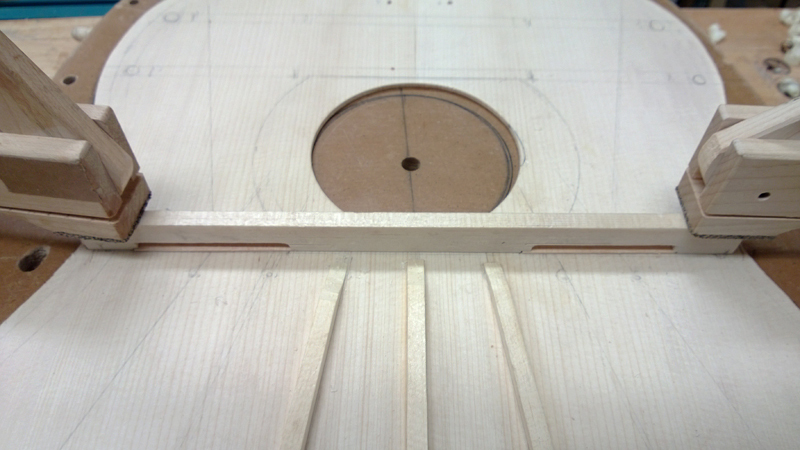 You can see in the following picture that there are three steps on the neck\rim assembly. 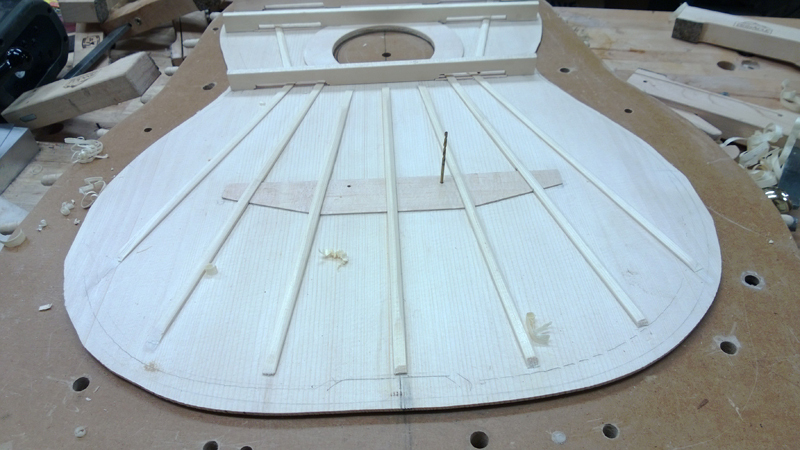 The first step has to be exactly as deep relative to the edge of the rim\kerfed lining as the fret board patch is thick. 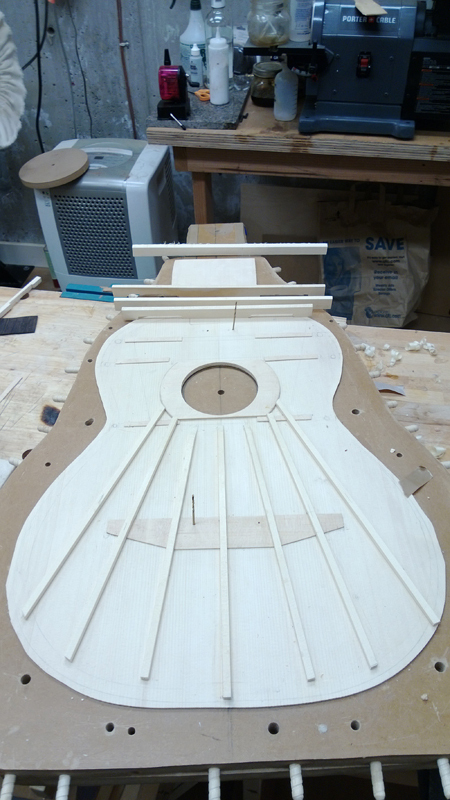 The next step needs to be the depth of the top thickness so that when glued the top and the neck are level. Here is where I made a mistake. I thought I had everything properly profiled when I noticed that somehow a two inch portion of the top rim had a slight gap. 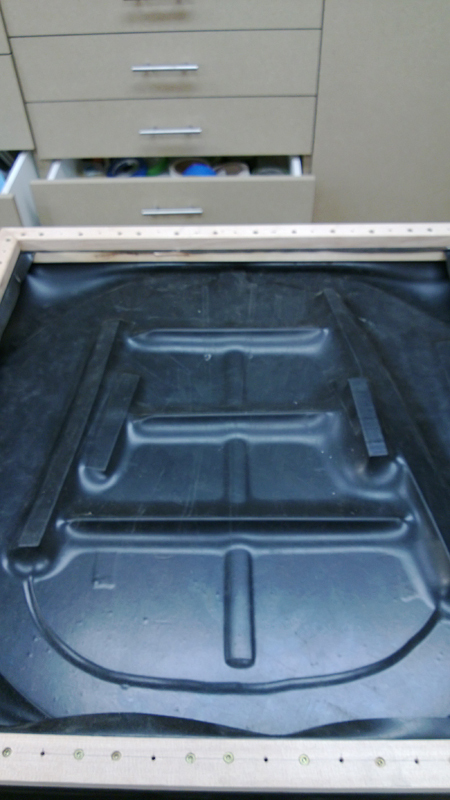 I thought no problem, I carefully used a flat board to sand the rims down perfectly flat. Well given that I had glued the rims in the neck that left the top sitting too low relative to the neck. Whoopsy. Luckily I had only tacked the rims into the neck slots with super glue. I flooded the joints with super solvent and was able to remove the rims from the neck and properly reset them. I am making good progress on the top. 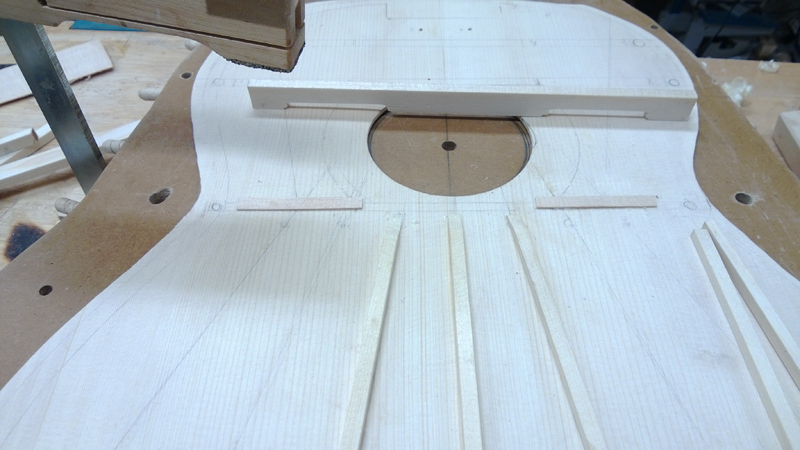 The bracing pattern I am using is a modified Hauser 43 plan that I learned in Jeffrey Elliott top voicing class. The interesting thing about this pattern is that it uses open transvers braces to open up the top. 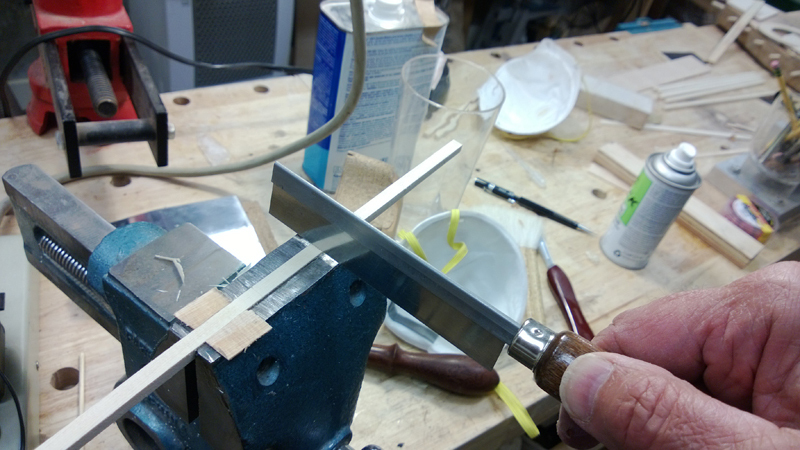 To avoid cracking I am gluing 1mm think straps of wood to bridge the openings in the transverse braces. The middle fan brace is 6mm tall the next outside braces are 5mm then 4 mm and the outside braces are 3 mm tall. Not in the picture there will be two 3 mm fan sixed braces in the upper bout to help against cracks and Jeffrey Elliott thought his guitars sounded better with it on. I used a plane to put close to a 25 ft radius on all of the lower fan braces. I used to use a dish but it is so easy to sand an angle on the bottom that I now use a plane and use the dish to check the fit. 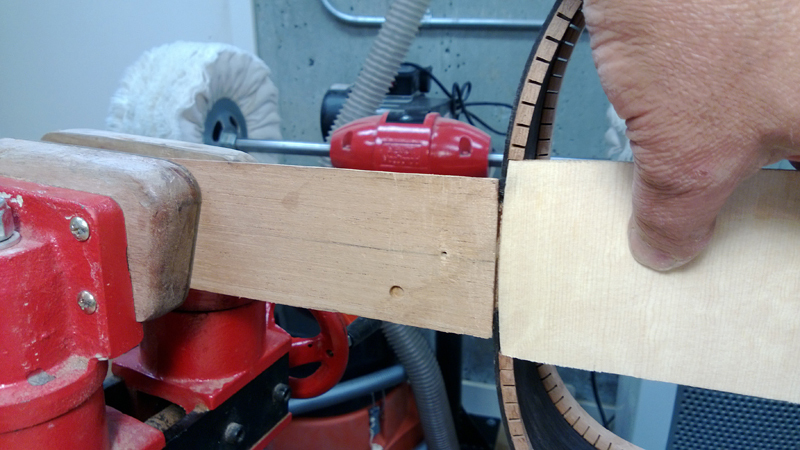 Using a block plane I sort of established a planning pattern that resulted in close to the correct radius. I glued some cut off from my sound board patch to my vise and used it to gauge the correct depth to provide relief for the sound board patch and on the outer braces the strap underneath the transverse brace opening. 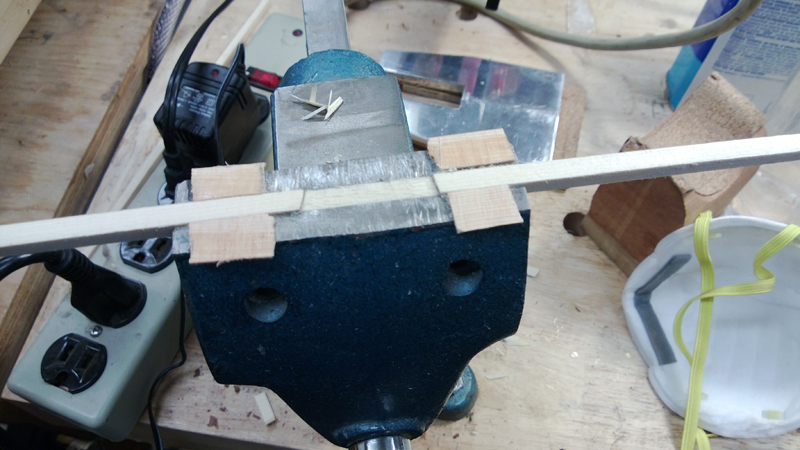 I used the same technique for the transverse brace to make small rabbets for the strap that will bridge the transverse brace opening. For each of the open transverse braces I used the transverse brace with cuts straps to properly fix the location of the strap. I clamped the brace in the proper location, setting the location for the strap and carefully taped down the strap. I was able to use the tape as a hinge to fold back the strap put glue on it and move it back in to the correct location. I used my homemade vacuum box to glue the fitted fan braces down. I am hoping to close this guitar this weekend. I have a few things that I need to do first, that I hope in my excitement I do not forget. Mainly I need to install the end strip or wedge. Late Sunday and bit by bit through the week I finished the bracing of the top and started on the back. Hoping to raise my game a bit now that I have my vacuum box. 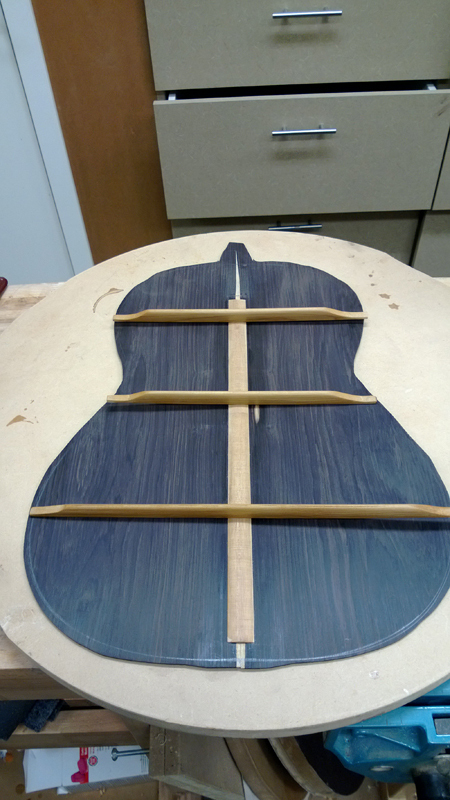 I pre-carved the back braces and put a few coats of shellac on them. 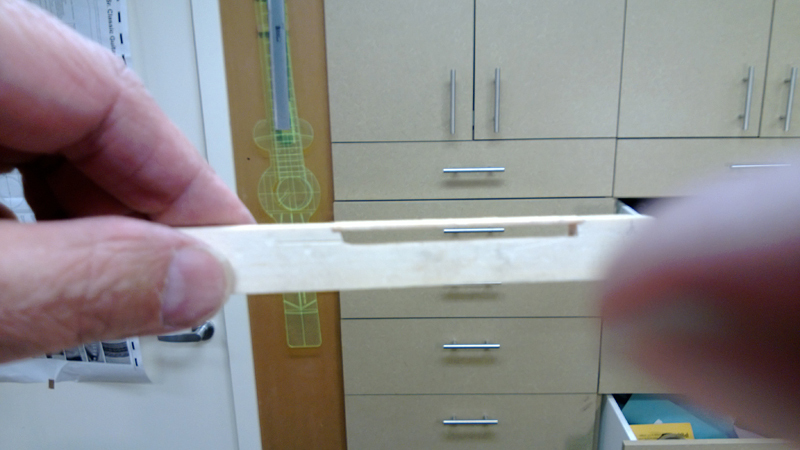 The idea is to have sealed braces and center strip but still an unsealed back on the inside. No reasons other than I hope it looks cool. When gluing the braces down in a 15' radius dish I was not happy with the way the end of one of the braces was gluing down so I put a few bits of brace wood on the ends of the braces to hold them down with the vacuum. Ultimately there was no problem with how the braces glued down.